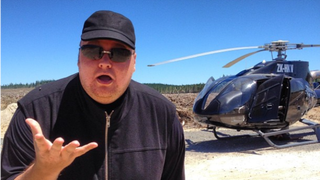 Kim Dotcom is probably the most wanted man in the movie theaters' fight against piracy. He's under investigation by the FBI, and they're trying to extradite him from sunny, safe New Zealand to the States. But those pale in comparison to his latest problem: his account on Mega, the cloud storage site he founded last year, just got terminated. Oops. According to Torrent Freak, the account takedown was triggered by a series of false copyright-infringement DCMA requests, sent in by a prankster. But apparently that was enough to take down Mr Dotcom's account, at least temporarily: if you follow a link to any of the files shared by his account, you get a fail page. Someone (I'm hoping the FBI) has an excellent sense of humour.